During a recent drive through my hometown, I noticed that my junior high school (or middle school in today’s vernacular) had been replaced by an entirely new building. I was rather surprised because the old structure was built like a tank. Curious, I asked some of my local friends why the old school was razed. “We needed an elementary school.” “Asbestos.” “Needed a new roof.” “It was old.” “Was time for a better learning environment.” The last one caught me because I’ve heard that issue in many towns in which I lived. There seems to be a recurring theme that children will learn better when they’re sitting in a contemporary school with all the modern amenities. I’m sure there is some truth to that, but I decided to reflect upon my own education. What stood out? Not the buildings. What stood out were the great teachers. Though I can still somewhat envision my school buildings, I very clearly hear the voices and lessons of many of my teachers. 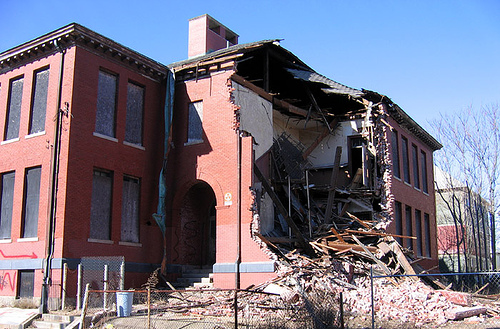 When communities raze older schools with the aim of improving education, they’re frequently missing the mark. Of course everyone acts surprised when the subsequent standardized test scores don’t go up. (“But we have such a beautiful new campus.”) Communities and school systems should focus on developing excellent teachers if they want to improve learning. That’s the essence of education. Those of us in business witness similar effects. We do our own razing, which we call “reorganization.” Too often we reorganize with the hope of bringing about transformations in the business. Like the standardized test scores, the business results are often unchanged. And everyone acts surprised. Organizations should focus on developing excellent leaders if they want to improve performance. That’s the essence of business. For both business and education, it’s about leadership first, jackhammers second. I like your comment regarding leadership. Great article Rob! Good post Rob. Indeed the teacher in the classroom provides infinitely more on a day-to-day basis than a nice entryway in a school building. But even more than teachers is the role of the parents, as they constantly are putting the development of their children before their own self-interests. You can extend this analogy to the business world — leaders should always put their company’s best interests before their own personal objectives. (One of the key messages in “Good to Great”, which I know you are familiar with). Tom, I wholeheartedly agree. Too often teachers are expected to be proxy parents because many parents have abdicated their responsibilities in the educational process. It’s a grey area. The business arena is also grey and it’s frequently impossible to figure out whether some leaders have abdicated their commitment to the companies they serve because their facade masks excessive self interest. Perhaps that’s why good outnumbers great.